I read this article and found it very interesting, thought it might be something for you. 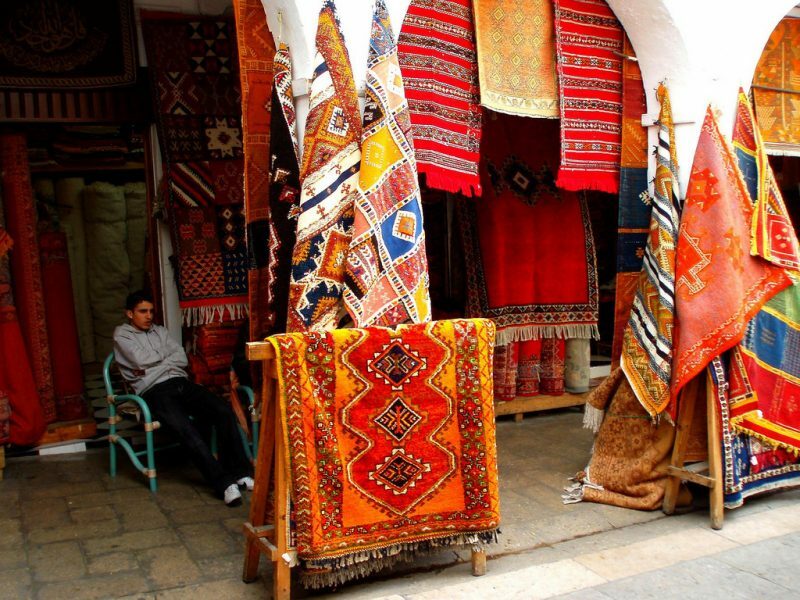 The article is called 15 Places to Shop in Morocco and is located at http://trip-n-travel.com/listicle/22317/. 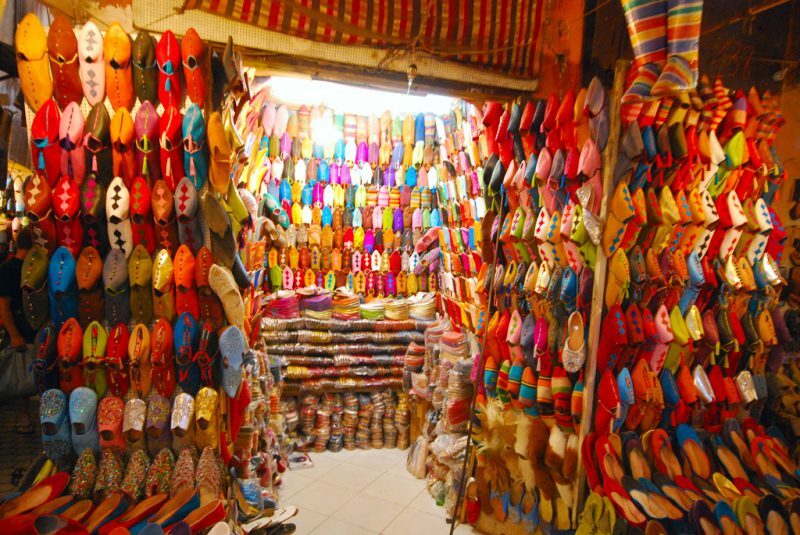 Shopping in Morocco can be a fascinating and mind-blowing activity. There are a variety of items on sale; from antiques, beautiful carpets designs, gorgeous jewelry and so much more. Modern cities known for having most of these items on sale are the cities of Marrakech and Fez. You could also try something different by going to the areas where the commodities are made. Here you will be sure to get the best deals. Morocco is known for the souks; these are open marketplaces. Some are opened on specific days and are named after the day when they are open or on a weekly basis. However, a must know for everyone is that you should be ready to bargain prices as they are always stated at a high price. Putting your bargaining skills to use could land you a deal at half the price, with the trader still pocketing a profit. Practice your hustling skills and don’t go shopping with a guide. Well, this is if you don’t want to be ripped off. 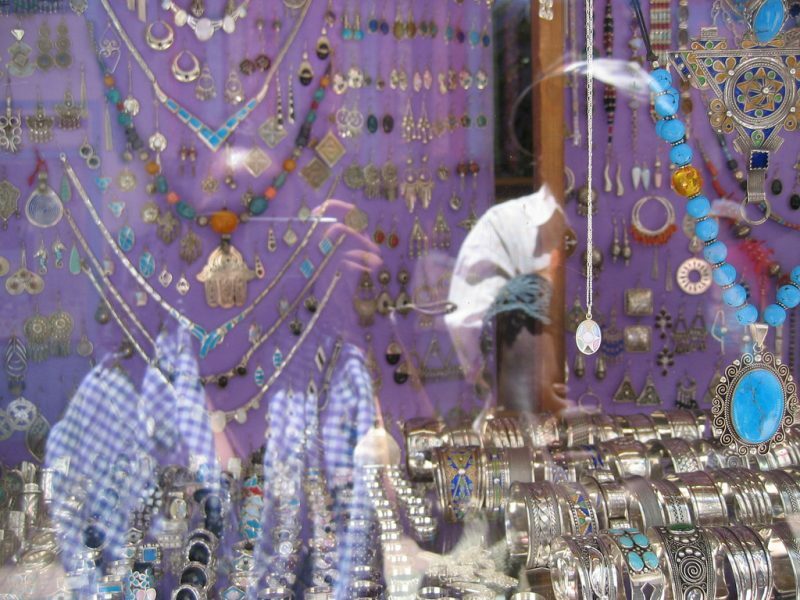 The Tiznit Medina has a souk dedicated to jewelry only. There are mostly made of silver from bracelets, belts to necklaces. They are majorly very chunky and may not be as per the ‘western’ fashion standards. Semi precious stones are used for decoration on the jewelry. You will find the jewelry donned by the Berbers. It is believed that they inherited the jewelry making skills from their Jewish brothers. They have some beautiful pieces on sale. There are brooches used to hold garments in place. Some of the jewelry even have the symbol of the ‘hand of Fatima’. Popular belief has it that it wanes away evil. The Marche is a center in Marrakech that deals with everything you can find in a souk. If you want to access everything in one room rather walking from stall to stall, then this is the place to be. Here they have on sale a vast variety of the Moroccan spices. You will find the much-famed spice mix, Ras el Hanout, and even saffron. All are in plenty. You could purchase some for you to take back home if that’s allowed. 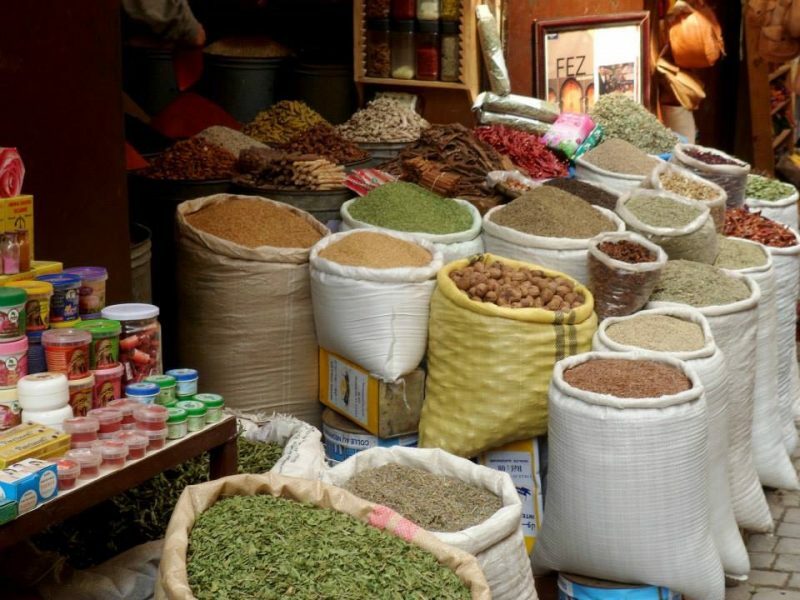 Moroccans love their spices which are added to almost every type of delicacy. After spending some time in Morocco, it is likely that you’ll be adapted to their meals. Though, some argue that their food isn’t as spicy as Mexican or Thai food. Well, that will be for you to decide. There is also some exquisite pottery on sale and wood products made from thuya. This is a small cooperative comprised of 40 members. They are all women and can be found at Aït Bououli, Morocco. They specialize in carpet making made of wool. When you pay them a visit, you will get to see the women at work; from shearing the sheep to spinning the wool into yarn. It is a fascinating experience to observe as they go their duties. They have a shop on site where they sell their beautifully finished carpets. They use plant dye in the coloring of the carpets. It isn’t a difficult place to spot as it is adjacent to the mimetic villages in the area. It is made of stone walls with a signboard to direct the visitors. Fes is another well known and busy shopping area. It is popular for the high quality of the carpets that you will find on sale. You will be able to purchase the carpet directly from where it is made. This implies that you will find a vast variety to choose from, and you may end up not being sure of what to and what not to purchase. Here, you will have to use your bargaining skills to good use. As earlier stated, the initial price quoted maybe even ten times the correct price of the product. Most of the bargaining takes place over a cup of tea, so be prepared to have one if you want to close a deal. It is just a custom that they price. Remember not to ask for the price if you are not ready to purchase the commodity. This is an all natural cosmetic and health shop. All their commodities are certified to be 100% of organic materials. They have their garden from where they get their raw materials, as proof. You don’t have to worry about getting fakes. Beauty products at the shop comprise of avocado, argan, and wheat germ. This a splendid place to supplement your beauty kit with all natural products as they are safe to use and don’t react with the skin, unlike their counterparts. The female folk understands this majorly; your skin needs nourishing, and there’s no better way than to use organic products. Just as the name suggests, this is an area dedicated to arts and crafts. It is characterized by a lot of activity as the artisans are busy at work. They also display their finished products for sale. Here, you won’t have to worry about haggling as the prices for the goods are fixed. There are leather products for sale, jewelry, and even carpet making. The great thing about this place is that you get to see the people practice their craft. If you are an art person, you could learn a thing or two from observation, ask questions and learn something new. It will be a fulfilling experience. 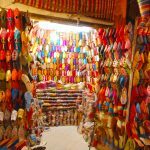 The souk is located in Marrakech and will be more appealing to the young and trendy. There are vast displays of ‘modern’ clothing. At Ipanema, you will be spoiled for choice on the knitted beanies that have Berber-style touches. You could also purchase some beautiful velvet boots at the Couturier. You will get to lay your hands on edgy purses that are made of Parisian style. It is a mini-market with numerous goods that will draw your attention. It isn’t wrong to go window shopping as you fill your eyes with the cute displays. You could also get yourself a personalized bag or hat. Something you would want to carry around with you when you get back home. This Medina is located along the Essaouira Port. It is very busy in the evening as traders line the streets displaying their goods on sale. You will get to see unique woodcarvings that will draw your attention. It is fantastic to watch as the artisans are busy at work. Carving beautiful designs on the various pieces. They have put up a board that displays the different shipping rates for the goods they have on display. Well’ that is for you who would like to have an item shipped back home. You will also get a chance to see ornaments made from shells and coral from the sea. There are clothing and utensils for your house. Lucky for you, the prices of the goods aren’t fixed, and you could haggle them down to the amount that you can afford. This is an arts and craft shop with traces of Japanese and Moroccan influences incorporated on the type of materials produced. The shop has a fascinating story of a Moroccan artisan who met another artisan with Japanese heritage. 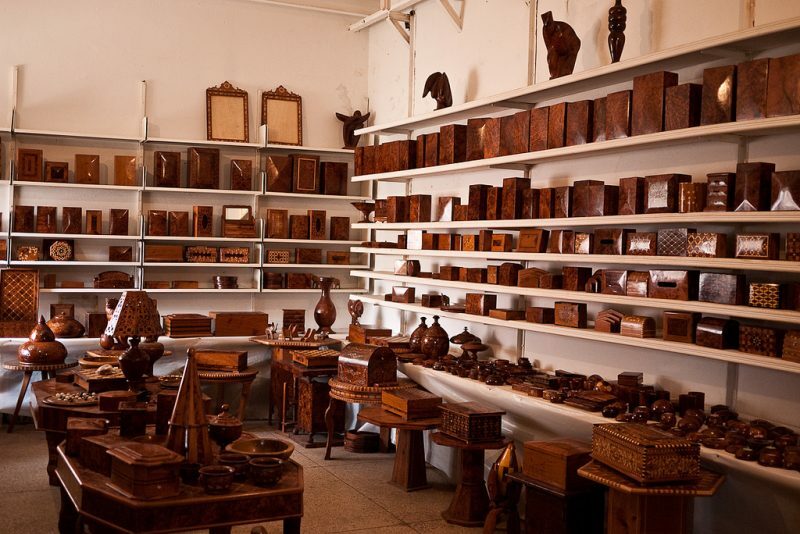 They found common ground in their love of art and thus together; they set up shop in Marrakech,i.e., Michi. The babouches from the shop are made from sacks. Babouches are a type of slippers that are commonly used in Morocco. This should be your number one souvenir to take home as it is among the different things that identify with many Moroccans. Recyclables are the primary raw material at the shop, with hammam bags made from recycled feed bags and mirrors from oil drums. The small, quaint and ancient town is a perfect place to purchase your souvenirs. It is a peaceful area with not much hustle and bustle compared to the other Moroccan cities. Even bargaining for prices isn’t as stressful as in other cities. Commodities sold at the Medina are indigenous to the locals who live in the mountains surrounding the Medina. You will find wonderful art pieces and also, traditional Moroccan clothing. The area is known for the long skirts striped in white and red, for the Rif women. There are antique silverware on sale at affordable prices, from jewelry to utensils. There are also kaftans, which are jackets made from wool on sale. You will also get to see djellabas and decorative plates on sale, among many other fabulous goods that the area has to offer. This shop offers a range of rose flower extracts, products. It purchases the roses from local farmers and uses them as raw materials for their goods. They use rose flower extracts in cream and soap production. Beautiful scents of the rose flower fill the air, as everything is made from the rose flower. Their showroom has a magnificent display of deodorants made from the rose flower. There is aftershave, in plenty there too. It should be your number one go-to place for the lovers of flowers especially roses. It is located in Kelaâ M’gouna, Morocco just a few distance before you get to the downtown. The Market is Casablanca’s fresh produce market. If you happen to be in Casablanca, Morocco, then this is the place to do your grocery shopping. However, it opens in the wee hours of the morning, and that’s the best time to make your purchase as you will get the best. Some sections also open in the evening, if you didn’t get to do your shopping in the morning. Some florists frequent the market with a fresh selection of lovely flowers. Restaurants and small eateries line the market thus making your shopping easier as you can head to a restaurant to rest and have a meal after you have finished shopping or even in between shopping. The center is community-based in Ouarzazate. It is a community development project of some sort as it helps the destitute in the society to make a living. Those who are under the project are taught how to make and decorate pottery, utensils, and even jewelry. The goods are then sold and the money collected is used for their support. You will some gorgeously decorated tea sets. There also henna-painted pottery on sale and beautiful silver filigrees. If and when you shop at the center, this will be your little way of supporting the community. The goods on sale are affordable and at a fixed price. The gallery has a fabulous display of pieces of art. It was once the home of a local calligrapher in Tinejdad. There is an amazing array of locally made crockery. There are beautiful sand-worn bracelets in the salon. There are also, beautiful teapots made of silver and nickel. It is a pleasant place to enjoy and admire the indigenous artwork of the Moroccan people and more so, embrace the diversity of the Moroccans. This region is mainly populated by the Berber people, who are situated in the mountains mostly. Here, you will find various locally produced handicrafts to beauty products. Bargaining is the order of the day, so, you better be prepared. 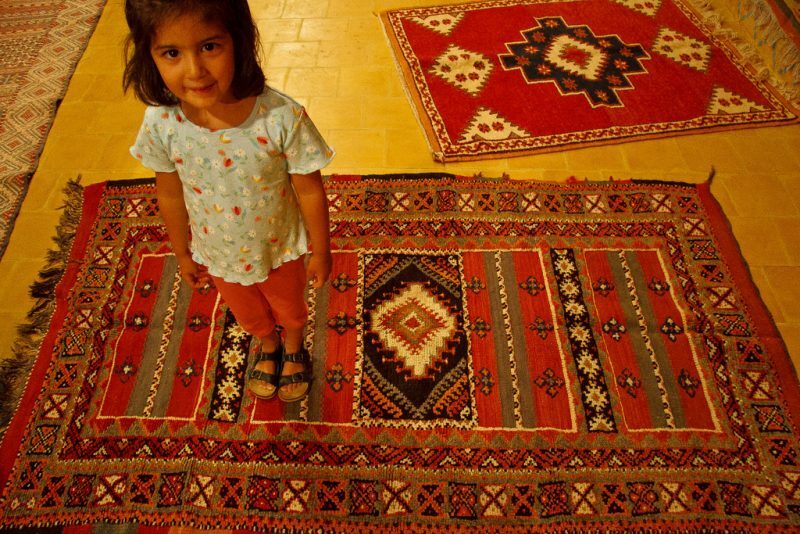 They have exquisite handwoven carpets in hot colors. The carpets are sold according to the number of knots that the carpet has. For the ladies, you will be able to purchase the Berber red hot lipstick. It is unlike the common lipstick types. It is made from red ochre mixed with oils and herbs. The combination is then shaped into a small bowl which when moistened; it releases a red dye which you then apply on your lips. 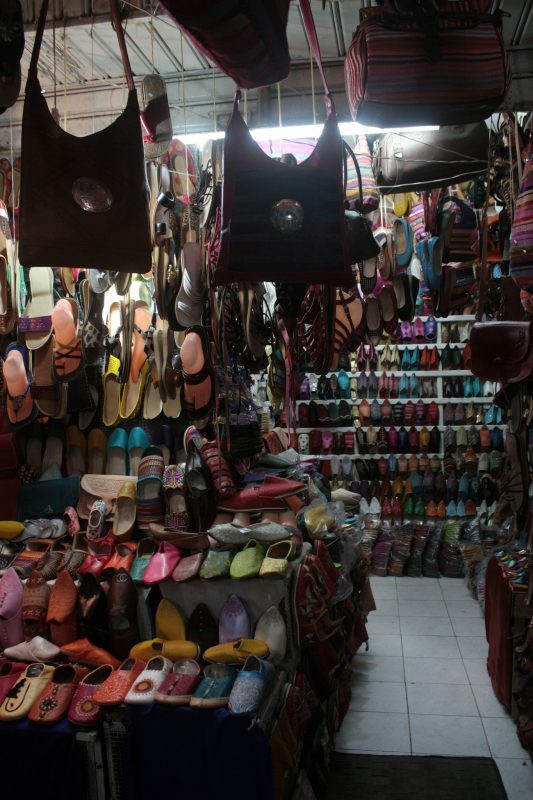 There are numerous areas to go shopping in Morocco. There are beautiful handwoven carpets; and you get to see the artisans at work and you are offered a wide variety of goods to purchase, antiques included. It is an exciting experience. Remember, you have to know how to bargain if you don’t want to be ripped off. Don’t take a ‘guide’ shopping with you and not everything is what it is said to be, as some of the ‘Antiquities’ are fakes. But be sure to get your money’s worth.